As the biblical clock counts down, the destinies of Israel and the Church are converging. As God's people, both Jew and Gentile, make themselves ready as his warrior bride, Christians will face increasing spiritual warfare that intersects with warfare in the natural realm. Sandra Teplinsky calls Jewish believers to stand firm in these times of intensified opposition and make themselves ready as the bride of Christ. Israel's Anointing encourages believers to take up the biblical mandate to make Israel jealous, to help God's chosen people see this company of militant lovers in whose midst Yeshua dwells--and want him at last. 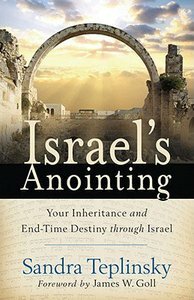 Anyone with a love for Israel and an eye toward the end times will connect with this powerful book. Sandra Teplinsky, trained as an attorney in business litigation, is founder and director of Light of Zion, a teaching and intercessory prayer ministry. With her husband, Kerry, also a Messianic Jew, she speaks at churches, seminars, and conferences on Israel and the church; the Jewish roots of Christianity; and Messianic Judaism. She is the author of Why Care about Israel? and lives with her family in Anaheim, California.